Yesterday in the Vatican In an unprecedented gesture, the pope makes history. During the conclusion of a two-day retreat at the Vatican for South Sudan's political leaders. 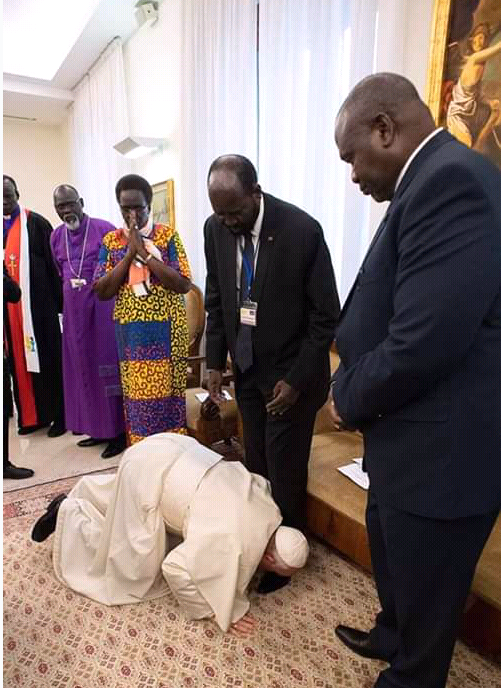 Pope Francis kisses the feet of South Sudan President Salva Kiir as he prays and begs for peace in that country. This is humility in service to God. And is significant, like Christ Jesus washing the feet of his disciples, he that wants to be number one among must be a servant to you all. God bless the pope, and all his servants who struggle to make peace prevail in our world today.